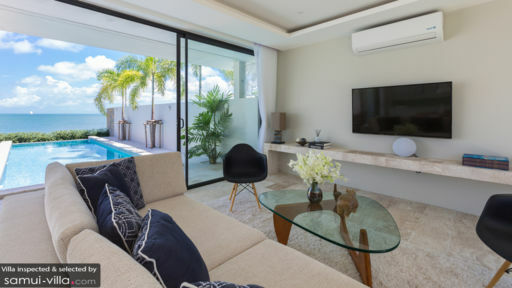 Designed with meticulous detail to create an island-inspired abode, Villa Song is a two-bedroom tropical paradise that offers the best outdoor/indoor living. Found along the shores of Plai Laem beach, Koh Samui, the villa is part of Skye Beach Villas. Guests are free to rent out the neighbouring villas part of the same estate in order to accommodate a larger group. The villas are interconnected and similarly designed. There is a lavish swimming pool at Villa Song with an infinity edge, an outdoor shower, and ocean-facing bedrooms for the most spectacular time. Slide open the glass doors towards the back of the living area and you will reach outside where a patch of grass leads to the two distinctly-situated bedrooms. Facing the ocean, the glass-enclosed bedrooms can be cordoned off with the help of blackout curtains. Furnished with plush, king beds, the bedrooms offer utmost comfort amid elegant surroundings. A beautiful natural stone pool deck has been designed to face the horizon that stretches far and beyond. The sun-kissed skies are a moving painting to your relaxed mien. 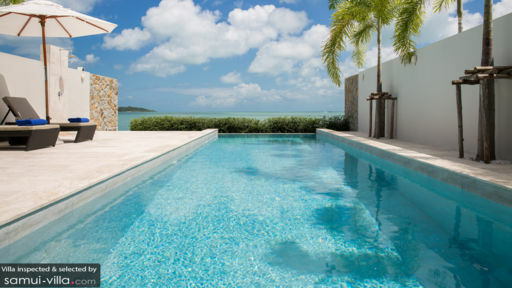 The swimming pool at Villa Song takes the cake with its pool edge that expands as if to meet the sea. The mesmerising panorama is yours for the taking as you can simply lounge on the recliner sun chairs and lose yourself amid this natural abundance. A four-seater outdoor dining area has been set up for many dinners under the starry-night sky. The second part of the villa is attributed to its contemporary and elegant living pavilion that displays floor-to-ceiling glass doors set in a black metal frame. These doors can slide open for some fresh air or you can keep them shut to enjoy the air-conditioned indoors. The living area houses the dining area and kitchen as well with a comfortable seating where you can watch TV on the flat-screen, rest, and recharge before heading out for the night. The minimalist elegance comes through its majorly-white décor. Modern comforts are plenty such as high-speed internet, surround sound, and false ceilings. Right beside the sitting area you have the round dining table that can easily accommodate six guests. The space is cozy enough that you can enjoy hearty meals at all times. The best part has to the be the looming skies and ocean beyond. The room is well-lit and naturally ventilated so you have to yourselves a refreshing and rejuvenating space. There is a fully-equipped, modern kitchen with top of the line amenities. Villa Song also accommodates an enviable media room with a large projector screen, surround sound, air-conditioning, and plush seating. The villa is managed by the staff at Skye Beach Villas to ensure that everything is up to standards. Housekeeping, security, and maintenance is well looked after by the team. There is a private chef on call who is trained in Indonesian and western cuisines. 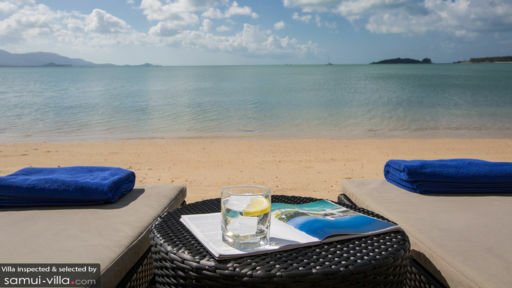 Villa Song is ideally situated in the midst of popular sights in Samui from the Big Buddha to the bustling Bophut area. There are plenty of restaurants, cafes, and beach bars in the vicinity such as Dining on the Rocks, Q Bar, and others. A ride to Fisherman’s Village will also be fulfilling for its historical connotations and a journey into the past.